As we go about our lives each and every day, it can become easy to take all the innovative technology that surrounds us for granted. Every once in a while, though, it will hit you as you realize that you just used the tiny supercomputer in your pocket to look up an obscure fact about ancient Egypt, order a pizza, and book tickets to the movies – all over thin air – that wow, we’re really living in the future! Technological advancements and innovations haven’t just limited themselves to the smartphone market, either. 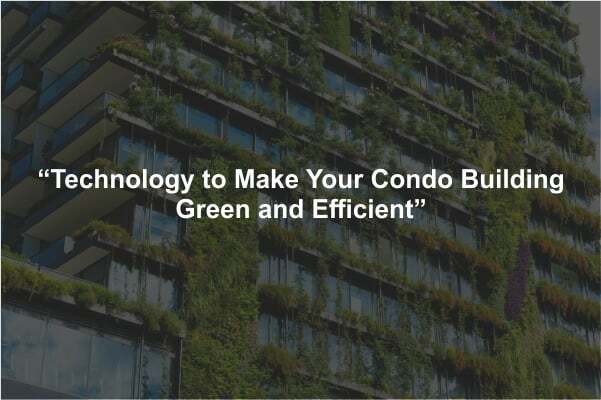 There’s no shortage of forward-thinking solutions and future-minded tech being implemented right in our very condos to help make our lives easier, create habits that are more sustainable, and push towards fostering healthier, greener buildings through efficient and responsible financial management. Keen to learn more about these interesting advancements? We hope so, because that’s what we’re about to dive head-first into exploring! Building sensors are becoming more and more commonplace in newer developments and proactive condo communities, and with good reason. These helpful bits of technology work by monitoring abnormalities and fluctuations to act as early predictors of potential failures within some of the major systems of a condo building, as our partners in sensor development and deployment at BiLD (located right here in Calgary!) can attest to. Vibration sensors monitor the health of mechanical and motorized elements of a building’s infrastructure, while temperature sensors are put to use ensuring that pipes are in good condition and not at risk for freezing or bursting. Both of these sensor types will not only help residents and board members better monitor and understand the lifecycles of the various components that make up a condo building, but they can also identify potentially catastrophic failures before they happen, saving you from the singular experience of waking up at 4 in the morning to find your condo covered in 2 feet of water or sitting at a balmy -10°C! In addition, sensors can also help reduce the number of annual service visits, leading towards improvements in building efficiency and potentially even lower insurance premiums – not too shabby for a few electronic bits! We covered reserve fund studies on this blog just a few months back, and while you may have walked away from that blog thinking that this sort of financial planning is a great idea when it comes to condo management and maintenance, you might be wondering how this represents any sort of an innovative technological advancement. While reserve fund studies are simply an example of responsible budgeting, it’s the living reserve fund study that represent a leap forward for the industry. As opposed to the helpful but static reserve fund study, living reserve fund studies are dynamic and fluid. While reserve fund studies are updated every five years only to sit stagnant as inspections, maintenance, and day-to-day operations carry on throughout the condo building, a living reserve fund study is a flexible and updateable application developed by BiLD that accepts ongoing new information entry, allowing for condo boards to realign following any major maintenance or upkeep, resulting in cost reductions and more-efficient, less-disruptive condo management. Solar is gearing up towards being the next big thing in sustainable, future-minded living, and the condo industry isn’t about to be left behind. Companies like Alberta’s own Natural Energy Generation are leading the field when it comes to developing renewable energy solutions and pioneering the way forward in creating cost-effective, sustainable solar solutions. The result? A painless installation that paves the way for energy savings in your building with no contractual obligations, allowing the condo corporation to own and sell the power generated without having to own the equipment itself, while also creating a building-wide system that will reduce costs and provide green, environmentally-friendly power for years and decades to come. Pretty cool stuff! After covering all these exciting technological breakthroughs and advancements, it really does start to feel like we’re living in a sci-fi movie – just with less spaceships, and more intelligently-designed condo complexes! Innovations are always happening, and buildings are constantly getting smarter – set your condo community up for success by adopting these technologies early so that you can take advantage of them today and aren’t playing catch-up further down the road! Are you feeling inspired after reading about all these exciting technological innovations? Eager to see about bringing some of these unique advancements to your condo board? Get in touch with us at Catalyst Condo Management today, and we’ll be happy to chat with you about how to go about making it happen!